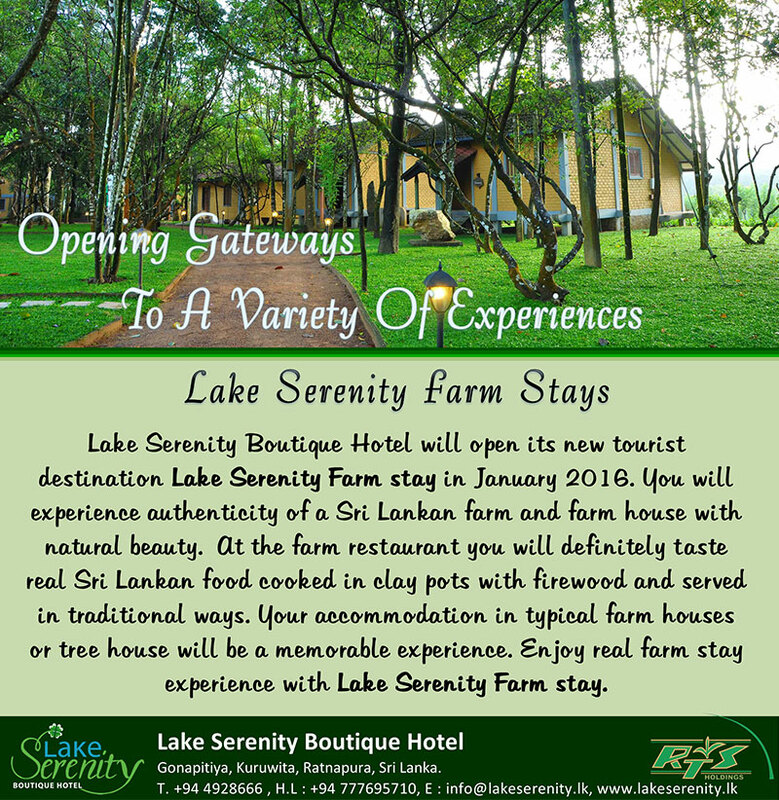 Best Boutique Hotel In Ratnapura | Lake Serenity Resort & Spa . Serenity is preserved in and around the Lake Serenity Hotel bestowing magnificent views for the guest to be indulged with the touch of tranquilization. The climax of the fascination of this hotel reaches the maximum with the still water puddle that covers the whole area. Eco-friendliness is exaggerated around here as the natural flow of birds' serenity river marks the borders encompassing an area filled with greenery and moist. The grace of this boutique hotel is magnified with the encircling paddy cultivations, tea plantations, rubber cultivations and the overlooking mountain range crowned with the milky clouds. As the luxuriousness is penetrated in to this hotel it gains the proud to be presented as one of the Best Boutique Hotels, Sri Lanka. 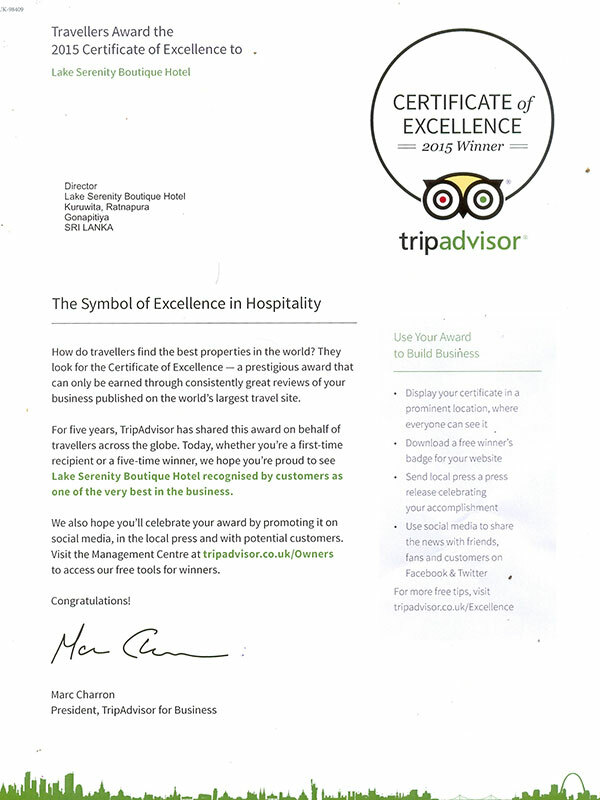 Beyond the successes of the previous year’s it’s our privilege to announce that Lake Serenity was awarded as the Top Boutique Hotel 2013, sustainability category. Considering this delight we like to extend our heartfelt gratitude to all our guests and we assure you to provide our best services always! 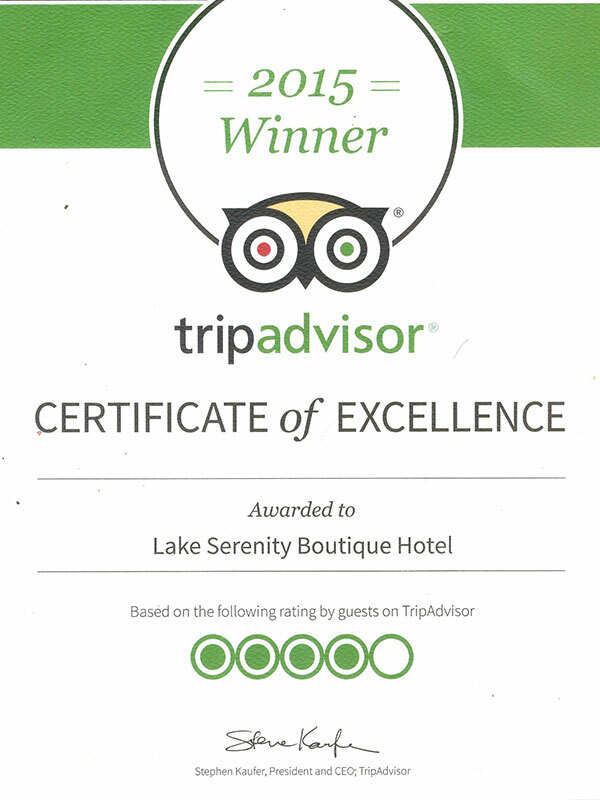 Beyond the successes of the previous year’s it’s our privilege to announce that Lake Serenity was awarded as the best boutique hotel 2013, sustainability category. Considering this delight we like to extend our heartfelt gratitude to all our guests and we assure you to provide our best services always! Jumping in to the swimming pool is a way of flushing away the stress with a splash of water. That's why Lake Serenity gives priority to the swimming pool so they could provide you the best feeling you'll get jiggling in pool. How do you like to go on a boat on a serene lake surrounded by an enchanting backdrop? Well, if you'd love to do that Lake Serenity is just the place for you. We promise our clients to arrange adventurous boat rides on the lake which makes the heart for the hotel. 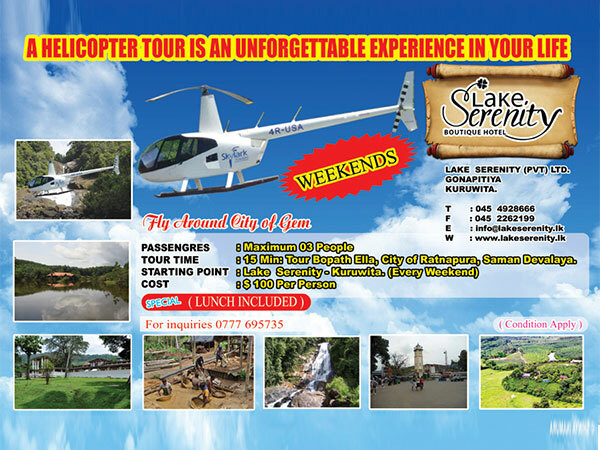 A recreational facility which apparently is essential for a human mind is allotted in Lake Serenity hotel which is a package of enjoyment, amusement, or pleasure. Are you looking for a place to completely rejuvenate yourself? You have come to the right place. Lake Serenity Resort offers you the best Spa Facilities that will help you overcome the negative energies inside you. How do you like to go on a boat in a serene lake surrounded by an enchanting backdrop? Well. If you'd love to do that Lake serenity is just place for you. 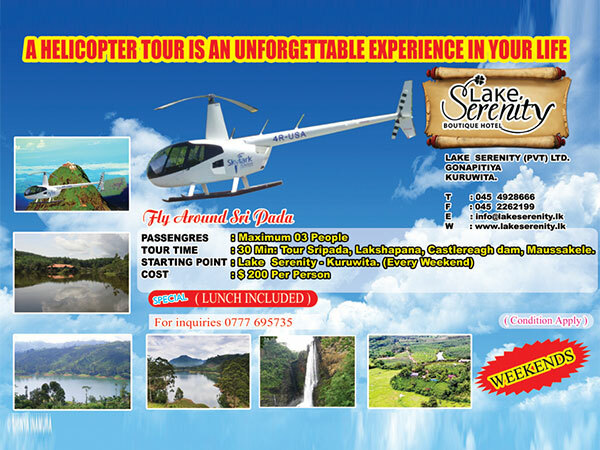 We promise our clients to arrange adventurous boat rides in the lake which makes the border for the hotel. Tea defines the royal taste of Sri Lanka. Visit Rathnapura to see the birth of your finest cup of tea. Almost Every visitor who visits LAKE SERENITY pays a visit to our Hidellana Tea Factory for..